At long last, the 2015 Poldark with Aidan Turner (Being Human, The Hobbit) in the lead roll as Captain Ross Poldark will premiere tonight on BBC One. American Poldark fans needn’t be worried. The steamier re-boot of the 1975 classic, which starred Robin Ellis as Capt. Poldark, is coming to PBS in June 2015. As many of you know from earlier Tellyspotting posts, Ellis took a break from his home in the picturesque French countryside and put aside his culinary passions for a brief moment to appear the new series of Poldark as Reverand Halse, the clergyman with whom Ross shares the coach on his journey home to Nampara from Truro in the opening scene of the first series. Imagine. TWO Captain Ross Poldark’s in the same room and on the same set at the same time! Tellyspotting was able to grab Robin Ellis for a few minutes recently for an absolutely delightful interview to talk about his time as the Captain, his guest appearance on Fawlty Towers, what it was like when the original Ross Poldark came face to face with the 2015 version of Captain Poldark and how he occupies his time today in the French countryside as a culinary writer and chef. You’ll also read about a very familiar guest at his and Meredith’s wedding that will be instantly recognizable to fans of Downton Abbey! Tellyspotting: What attracted you to the script for Poldark? Robin Ellis: I really didn’t know the novels so I went for my first interview not really knowing what it was going to entail. I had heard of Winston Graham, however. I read for the producer and he called me back in a couple of times and with the director for a third meeting. I realized after that that this was a huge project so I went out and bought the first Ross Poldark book. I had never been in anything quite so big. I came to it fresh and realized pretty quickly that it was unlike anything I had ever done up unto that point. I had never done a popular series on BBC One. I soon realized that the quality of the original work in Winston Graham’s writing and the potential of the part so I was pretty keen. TS: Did your extensive ‘on-the-job’ theater training at Cambridge prepare you for Poldark? RE: Absolutely. The series, itself, dealt in words. It wasn’t merely an action series, although I rode horses and such. There were a lot of words. In 1975, I had just finished three years in a group called The Actors Company, which was formed by Ian McKellen and Edward Pettibridge in 1972. The idea was to give actors more of a say in the running of their work. We chose the plays, we chose the directors and we chose the designers. There were 17 of us and the meetings used to go on for five or more hours. The acting became almost something we did on the side. That three years of working on stage kind of muscled me up for the kind of experience that Poldark was. In those days, it was part studio and part filming (on location). We rehearsed for six days, shot for two days in the studio and had one day off so we rehearsed it almost like a play because you had to know the whole thing when you got to the studio because it was shot like that. In a sense, the work that I had done over that period of three years with the Actors Company, again, muscled me up for learning a lot of words and being able to articulate them and remember them over a concentrated period of time. RE: By necessity, we, unfortunately, didn’t go to Cornwall in the nice month, in the summer months because Cornwall is packed with tourists so we were there in early Spring and Autumn. It can be pretty raw and it was quite raw but it was right for the pieces we were shooting. Of course, that was 40 years ago and Cornwall has become quite the trendy place. In those days, it was not quite in the Dark Ages but it had its rough edges and we filmed at the end of the world. Lands End was very close to where we were filming a lot and it can be pretty rough. It was great to get out of the studio and go west. TS: Do you have any remembrances of Winston Graham on set? How did he feel, ultimately, about the overall adaptation of his books? RE: It was interesting because he didn’t approve of the adaptation of the first novel, Ross Poldark in four part. He very much disapproved of the way Ross and Demelza were brought together in a kind of shotgun marriage which he hadn’t written in his book. He wanted to stop the series, in fact. Clyde Frances, who played Frances Poldark, met Winston in a club in London and asked, “Why aren’t you with us? You should be with us”. By this time we were probably 14 episodes into the filming of the series of 16 and Winston explained the situation. Clyde Frances said come and see us on the set. So, at the end of the first series, he and Jean, his wife were there. And then, for the second series, a year later, there were very much a part of our every day life. They took a house in Cornwall and actually played extras in the series and became firm friends and supporters and were a very important part of our lives. We realized that it was down to him and his original story and characters that we were working with. Material that was beguiling and had lasting qualities. The books were popular long before it became a television series. We knew if was really very good quality storytelling and we valued it. 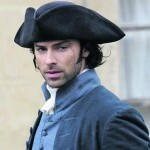 TS: As an actor, does it make it easier or more difficult to portray a character such as Ross Poldark that was well known with such an historical basis in books? Did it bring a set of challenges to your role given it was pretty much a completely known entity with respect to his ‘story’? RE: All I could do is play the scripts. Obviously, I had read the books and whatever that background reading did for me in playing the part. In fact, there were a couple of notorious instances where the script did not, for my money, live up to the original. There’s a famous in scene 13A in episode 7, I think, ironically written to lengthen the episode where my motivation, as it were, seemed to be quite the opposite of what it should be. I went back to the book and, sure enough, I was right. The original novel had written it as I thought it should be, as I felt it should be. My instinct was to play it a different way. We had a battle about it and we, ultimately, didn’t do it when we should. The producer took me out to lunch, said it’s only a play, Robin, bought me two steaks and tried to persuade me to do it. In the end, after about a week, we settled on some sort of compromise. The English always do. It was really interesting to see Winston’s respect in the sense for his characters and this is one reason why he didn’t, when we had finished the second series and it was suggested we do a third series and there weren’t any books because he had only written the four books at the time. He didn’t want to do story lines with other writers fleshing them out as it were because he said he respected his characters too much. In a sense, the characters had established a life of their own and there was less manipulation and less puppetry going on. They somehow wrote themselves and he respected that and, in fact, then wrote five more books. Hopefully, the new series will go on and do all twelve books but we didn’t have that opportunity, obviously, because that happened too late. TS: Can you point to any one element that has made Poldark last through what is now three generations to have seen the original series? RE: What has not changed over the years for good television is the value of the story, the value of the characters. They are good stories, good characters and that will be what the anchor of the whole thing is. Good stories are good stories. A new generation of viewers are going to love it. A majority of them won’t ever remember the first series. Very good writers with wonderful characters will keep programs going through a number of generations. The writer is the basis for everything. We were lucky with Winston. He was a very good storyteller. 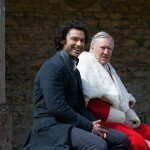 Captain Ross Poldark comes to Dallas…. TS: You went on whirlwind promotional tour to America during filming if I remember correctly. Any specific remembrances of your stop in Dallas? RE: It was in the middle of the second series and our director gave us two days off out of the six because we had a fairly light episode to come back to. We were shunted off to America to New York, Boston, Washington and Dallas. We had a terrific time in Dallas. I remember meeting Mrs. Neiman Marcus, which was extraordinary. I bought some cowboy boots, we went to a rodeo and we went to two parties. How we fit this all in, I don’t know. I mean, we were only there for 24 hours. I do remember getting off the plane and when the door of the plane opened and coming down the steps we were met by this incredible heat, this sort of blanket of heat, which I had never really experienced. I was hot. Really, really hot. The other thing I remember was being in the hotel and having to get up very early. Actually, I’m not even sure we ever went to bed. It was about 4 o’clock in the morning and I was shaving in the hotel room. The television was on because, you have to remember in 1977, we didn’t have all night television in the UK so it was quite unusual to turn the television on and see things going on. I was shaving and I heard this voice and I turned around and it was me. I had obviously turned on to PBS and it was me, it was Poldark on the screen. I remember thinking, instead of being astonished, I was rather cheesed off thinking ‘what are they showing this at 4 o’clock in the morning for. Is that what they think of it?’ (Full disclosure, KERA aired Poldark at that time as part of Masterpiece Theatre on Sunday nights at 8:00pm. The 4:00am broadcast was a repeat of that weeks’ episode because we thought so much of it to repeat it again. After telling this to Robin, he has now forgiven this 40 years later!). 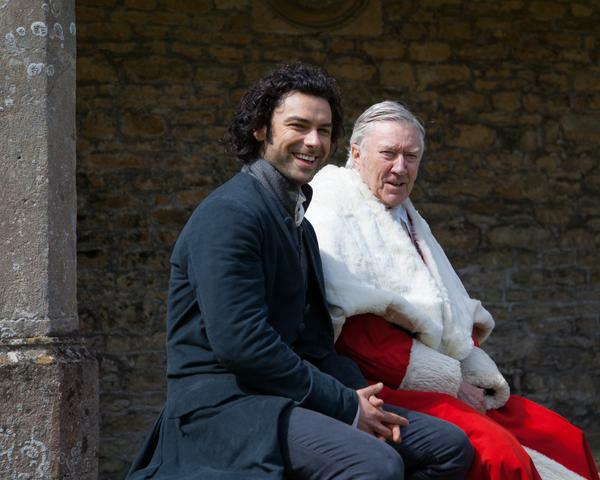 1975 Ross Poldark meets 2015 Ross Poldark…. 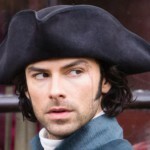 TS: Talk about your involvement in the new adaptation of Poldark. How did that come about? Who is your character? RE: Well, sadly, I think I’m the only principle character besides Judy Geeson, who played Caroline, that is still alive. Of course, Angharad Rees died a couple of years ago. Richard Morant died and Ralph Bates died some years ago. In a way, I’m still around so, it was slightly of a problem for them. (laughing) What are they going to do about another Ross Poldark so they very sweetly wrote to me a year or so ago and said will you have lunch with us. They took me out to lunch and asked what would you like to do? I said, I don’t know, really, I can’t remember the books, it was 40 years ago so when you have an idea just tell me about it and I’ll react. It took them about nine months, had the scripts done and they offered me a lovely part. It’s a small part in two of the episodes, it’s the Reverend Halse, who is a pretty mean old judge. In the original series, I played the same scene that I played in the new series back in May but I was the judge this time and Aidan Turner was Captain Poldark. So, I was facing myself, in a sense, and the director at the very end was very sweet and came on in the end of this big courtroom scene with a lot of people there and said, I just have to say before we all break up that it’s really wonderful to have two Ross Poldark’s in the same room. Everybody clapped and it was adorable. 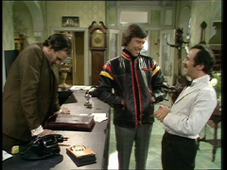 A pre-Poldark appearance on Fawlty Towers…. TS: Before Poldark, you appeared in one episode of Fawlty Towers. Any remembrances of the frenetic taping and John, in particular? RE: It was actually the pilot that I was in, the very first episode. It will filmed in 1974 about a month or two before I started doing Poldark. I had just come out of this three years of The Actors Company. I still don’t know why John Cleese chose me. I was at Cambridge with him where we were in a couple of plays together. He was in the Footlights side of the theater and I was in the straight side but he obviously remembered me for some reason. It was extraordinary. I think I earned 200 pounds for the week. I was very nervous. I had never done any comedy. Live comedy. Live in the sense of ‘with an audience’. You don’t know where to look. Whether to play to the audience or not. I was very nervous. It was a very interesting week. I do remember that I had to speak fluent Spanish in a scene because Manuel is instructed to take my luggage upstairs. As the story goes, Basil is very snobbish towards me because I have a Cockney accent and I’m lowering the tone of his hotel. He tries to get Manuel to take my case to my room but he can’t speak Spanish well enough to get Manuel to understand and I come out with fluent Spanish which was a real effort. I had to learn it by rote and grit my teeth. I did it perfectly first take and they came out and said ‘we’re sorry but we’re going to have to do it again because there was a camera in shot’. We had to do it again and it was in front of an audience. It was a fairly agonizing experience. As traumatic as it was, it’s wonderful because people love Fawlty Towers. John was very clever. He only did 12 episodes. It stands up as a piece of classic comedy with excellent writing. I’m so glad I did it. It’s a gem to have in your background. TS: Where did your culinary passion come from? RE: I grew up in the 50’s in London and my mother was a good cook in a straightforward way. She was very much open to new ideas. Instead of having Brussel sprouts that looked like cauliflower, we had Brussel sprouts that looked and tasted like Brussel sprouts. Just well cooked food. Around our kitchen table, we would have a Sunday lunch together as a family. I think with the two things together, good food and social meeting activity, and learning that pretty early on in my life, I’ve always enjoyed that. When I was single in the 60’s and 70’s, I used to cook for myself. Takeaways weren’t quite that readily available. I collected recipes like my mother did so it was something that I’ve always enjoyed doing. Then, in France, there are these wonderful markets and I wasn’t working as much as an actor any longer. Later, I was diagnosed with type-2 diabetes in 1999 and the idea of a cookbook had been suggested by friends. I didn’t feel qualified to do that, I wasn’t a professional cook. It’s very difficult to get things published these days, especially if you aren’t a TV personality or a restauranteur. I wasn’t any of those, I just liked to cook. Then the advent of type-2, I did change a little, not a lot, but I did change a little and it sort of concentrated the mind to where I thought well, maybe, something targeted might interest a publisher. That was five years ago. Then the blog started and it just developed, organically. FYI, Robin’s cauliflower soup is brilliant. You must try it! Is that Mr. Carson in a panda suit??? RE: Jim Carter, who is now world famous for playing the butler, Mr. Carson, on Downton Abbey. He and Imelda are friends and friends of my brother and they came to the wedding in 1990. Jim being Jim and full of fun borrowed a panda outfit. Actually, not borrowed it, he must have hired it. Because it was the zoo, he thought what can I dress up as and he thought, ‘ah, London Zoo, a panda is what they are famous for. So, he dressed up as a panda and interrupted our first dance with the married couple and danced with Meredith as a panda. We must remind him of that one of these days. Not sure whether he’d own it but it was a wonderful moment that we have pictures of somewhere. TS: Have you ever taken a moment at the end of the day to think about the millions of people that watched and enjoyed Poldark and taken in for even just a moment that you were a part of that? RE: I do. I’ve spent the last 40 years being grateful, very conscious of the part Poldark has played in my life and being proud of having done it. I’m still proud of it. It is wonderful. Not every actor has a part in their life that has that kind of resonance and to have had that as an actor is a privilege and I feel very lucky to have had it. The great thing is that it’s coming back again so the quality of Poldark and the reason for its popularity is going to be self-evident again. That’s terrific. 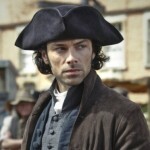 Poldark premieres tonight on BBC One and on Sunday, June 21, as part of PBS’ Masterpiece series in America. First video of ‘Poldark’ re-do set for June premiere on PBS.